Growth in the Canadian visitor market helped boost isle hotel occupancy in February, with Maui again leading the state and hotels on each island seeing a bump in revenue per available room. Statewide occupancy rose by 3.1 percentage points to 83.4 percent in February, according to a Hotel Flash Report released yesterday by Hospitality Advisors LLC. The average daily rate grew by 5.3 percent to $214, while revenue per available room increased by 9.3 percent to $178.37, both record highs for the month. Arrivals from Canada climbed 31.5 percent in February from a year ago, according to data released Friday by the state Department of Business, Economic Development and Tourism. Meetings and conventions, incentive visitors, and an 11.9 percent increase in typically higher-spending independent travelers also contributed to the bump, said Hospitality Advisors President Joseph Toy. "This is typically a snowbird destination for the Canadian market," he said. "The strength of the Canadian dollar against the U.S. dollar has really helped boost the market during this period." Maui led the islands with a 2.9 percentage-point increase from 2007 to an 84.8 percent occupancy rate, followed by Oahu, up 3.2 percentage points to 84.6 percent; Kauai, rising 5.2 percentage points to 82 percent; and the Big Island, up 2 percentage points to 77.2 percent. 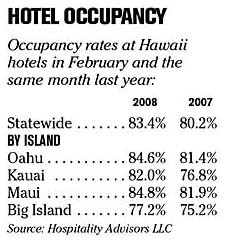 Economy hotels on both Oahu and Maui had the highest occupancy rates, at 93.5 percent and 88.3 percent, respectively. Maui also dominated statewide room rates at $290.09, up 7.4 percent from last year; followed by Hawaii at $217.17, up 6 percent; Kauai at $215.39, down 1.6 percent; and Oahu at $176.46, up 5.3 percent. Maui's luxury Wailea region posted a 13 percent increase to $449.27 with a 2.9 percentage point occupancy gain, while on the Big Island the Kohala Coast resorts saw a 1.7 percent gain to $317, with an 8.5 percentage-point occupancy gain. Revenue per available room increased on all islands, with Maui at $246, up 11.2 percent; Kauai at $176.62, up 5 percent; the Big Island at $167.66, up 8.9 percent; and Oahu, at $149.29, up 9.5 percent. "People are kind of waiting and are hesitant, and then they will book and book late," Toy said. "Generally we see that in a downturn. Although we did well in the first quarter, it will be interesting to see how we do in the second quarter, because that's really the slow season."